Visitors to Bon Secour National Wildlife Refuge in Alabama examine segments of protective boom. 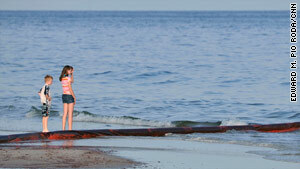 (CNN) -- Oil coming ashore on the Gulf Coast has tourists keeping a close eye on conditions. States and visitors bureaus are working hard to keep the public updated and reassure beach-bound travelers. All of Florida's beaches remain open, according to Visit Florida, the state's tourism corporation. Scattered tar balls have been found from the Alabama-Florida state line east to Walton County. "There have been no reports of Deepwater Horizon Oil Spill-related oil products reaching the shore beyond the Northwest Florida region," Visit Florida's website said. A portion of beach was closed Saturday in Panama City, Florida, after an oil container with BP markings washed ashore. There have been no oil impacts, the Panama City Beach Convention and Visitors Bureau website said. The water at Pensacola Beach is open for swimming and fishing, according to the Pensacola Bay Area Convention and Visitors Bureau. A health advisory has been issued for beaches stretching from the Florida-Alabama line to the entrance of Johnson Beach on Perdido Key, the Pensacola Bay Area visitors bureau said. Swimming and fishing in the affected waters are not advised. The National Park Service reported heavier oiling at Perdido Key last week. The area is part of the Florida portion of Gulf Islands National Seashore. All of the Gulf Islands National Seashore sites, which are located in Florida and Mississippi, are open, the park service's website said. Gulf Shores and Orange Beach, Alabama, have experienced significant oiling, accoring to the Alabama Gulf Coast Convention and Visitors Bureau. Public beaches in both cities are flying double red flags, meaning the waters are closed to the public. The beaches remain open for sunbathing and walking, the visitors bureau site said. The Alabama Department of Public Health has issued an advisory against swimming in waters off Gulf Shores, Orange Beach and Fort Morgan or in bay waters close to Fort Morgan, Bayou St. John, Terry Cove, Cotton Bayou or Old River. Oil is affecting more than 45 miles of Louisiana coast, according to a state emergency website, although most of the coast is unaffected. "The primary affected area is from the mouth of the Mississippi River extending east. Over 75 percent of Louisiana's coastal waters extend westward from the mouth of the Mississippi River," according to the Cajun Coast Visitors and Convention Bureau website. Grand Isle has closed its public beach, the site said.